People of Earth! This is your last warning! 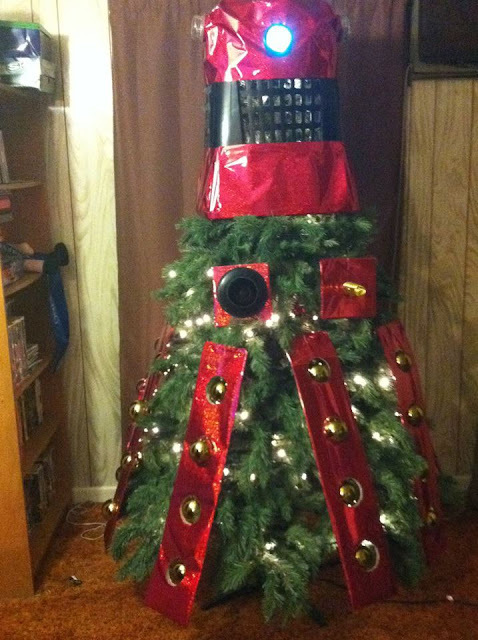 Prepare for Christmas, or you will be exterminated! When we first started creating this beloved villain, we figured a hamper would be great for a head because we could simulate the grill. We covered the bottom of the basket (top of the head) in crumpled newspaper to make it more rounded, then covered it in red wrapping paper. Then we covered the top (bottom of its head) in the same red paper. For the lights on either side of the head, we used the tops of candle jars and attached those with wire. Next we attached a push light, also with wire, and covered the front with blue tissue paper. Unfortunately, a full on eyestalk would have been too much... so I think we did the next best thing. The armor is made of cut-up cardboard boxes. The pieces were then wrapped in the same red wrapping paper. After measuring the gold ball ornaments, we used a compass to draw an outline then got to cutting. After all the holes were ready to go, we taped on the ornaments to the back of the pieces, added curtain hangers and attached the armor to the tree. We used the remaining cardboard to help create the arms effect. Instead of a paint roller, which I had initially intended, we used a corkscrew-esque ornament because it looked cuter... always important when designing a Dalek tree. Both those pieces also are attached to the tree with curtain hooks. The whole process, including assembling the tree and wrapping the lights, took about two days to put together with two sets of hands. I felt a little like a less-evil, Christmas Davros. So there you have it: The tree that will destroy all other, inferior trees this year. Many thanks to Ariel and her family sharing their creation with the world! On a related note, you haven't lived if you've never heard I'm Gonna Spend My Christmas With a Dalek, the 1964 novelty Christmas single from British group The Go-Go's. Warning: You'll be humming this for the rest of your life. Ariel's tree is so cute and clever! Nice job.